can be used, where n is the refractive index. Normally, nonlinear indices are measured for linearly polarized light. For circularly polarized light in a not birefringent medium, the Kerr effect is weaker by one third. At very high optical intensities, the equation above for the nonlinear index change may need a higher-order correction. For example, one may have a term proportional to the index squared, with a negative coefficient, so that the Kerr effect saturates. In addition to the Kerr effect (a purely electronic nonlinearity), electrostriction can significantly contribute to the value of the nonlinear index [5, 6]. Here, the electric field of light causes density variations (acoustic waves) which themselves influence the refractive index via the photoelastic effect. That mechanism, however, involves a significant time delay and is thus relevant only for relatively slow power modulations, but not for ultrashort pulses. In optical fibers, the contribution of electrostriction at low (megahertz) frequencies is typically of the order of 10–20% of that of the Kerr effect, but can strongly depend on the material. For transparent crystals and glasses, n2 is typically of the order of 10−16 cm2/W to 10−14 cm2/W. Silica, as used e.g. in silica fibers, has a relatively low nonlinear index of 2.7 · 10−16 cm2/W for wavelengths around 1.5 μm, whereas some chalcogenide glasses exhibit several hundred times higher values. Semiconductor materials also have very high nonlinear index values. 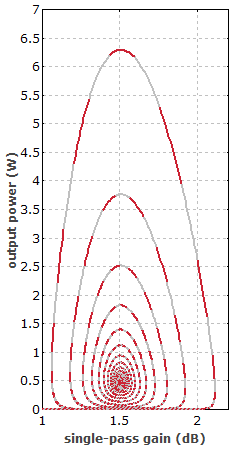 It has been shown that the nonlinear index scales in proportion to the inverse fourth power of the bandgap energy, but also depends on the proximity of the test wavelength to the bandgap . The nonlinearity can also be negative (self-defocusing nonlinearity), particularly for photon energies above ≈ 70% of the bandgap energy. Materials with a high nonlinear index often have a small bandgap energy, and therefore also often exhibit strong two-photon absorption (TPA). For some applications such as channel conversion in telecom systems, this is detrimental, and a figure of merit such as n2 / β (where β is the TPA coefficient) can be used to compare different materials. The measurement of the nonlinear index of bulk samples is often done with the z-scan technique, which is based on self-focusing via the Kerr lens. The nonlinearity of optical fibers can be quantified by measuring spectral broadening resulting from self-phase modulation. Note, however, that the polarization state may be scrambled in a non-polarization-maintaining fiber, and this can affect the result. Also, the result is a kind of average over the material properties of the fiber core and the cladding.